At Sir Thomas Boteler Church of England High School, we value the diversity of backgrounds of all students, families and wider the school community and ‘Through God, We Care’. 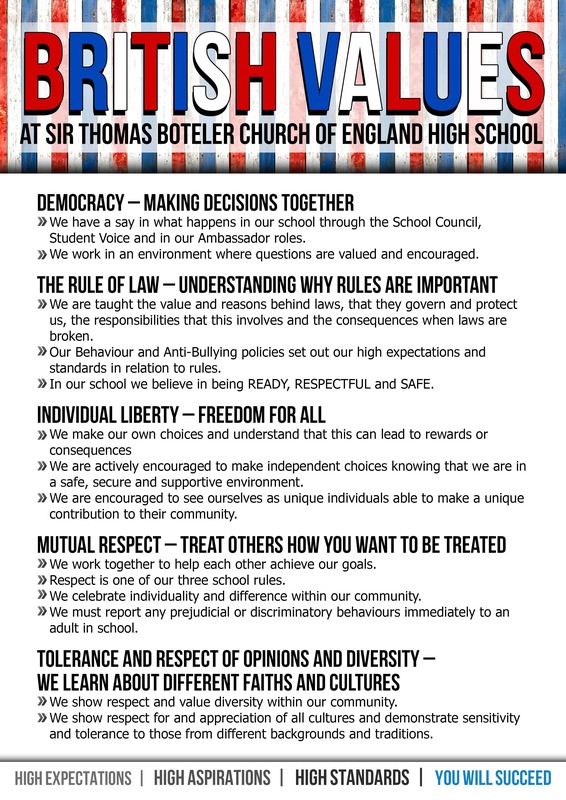 Our school reflects British values daily within the broader framework of Christian values. We encourage our children to be creative, open-minded and independent individuals, respectful of themselves and of others in our school, treating every person as an individual. We take very seriously our responsibility to prepare children for life in modern Britain. We ensure that the fundamental British values are introduced, discussed and lived out through the ethos and work of the school. Curriculum areas provide a vehicle for furthering understanding of these concepts and provide excellent opportunities to deepen and develop understanding beyond the local community. We believe democracy is an integral part of school life. Students have the opportunity to have their voices heard through, fostering an environment where students can confidently and safely debate their ideas. Students have the opportunity to take an active role within the school, whether this is by playing a key role in the School Council, reinforcing the democratic process, or through the Ambassador system. Students thrive in the responsibility of playing a key role and play a vital role in the decision making of the daily running of our school. Election of School Council and Head Girl and Head Boy. Student Voice is addressed through student focus groups, questionnaires and suggestion boxes. Informal voting on issues within form times and lessons. SEND students involved in their review meetings. Student involvement in the production of the Boteler Bulletin. Improve outdoor play and sports facilities for break and lunchtimes. The daily promotion of an environment where questions are valued and encouraged. The involvement in community issues and engagement with the Youth Parliament. The opportunity to vote for the local Youth council and engage with their wider program for the local community. School council members, Head Boy/Girl also represent the student body at governors’ meetings. We have participated in the Peers in School program and received a high profile visit from Lord Storrey to discuss parliamentary procedures and democracy. The Head of PSHE is a Gold Award Parliamentary Teacher Ambassador so is able to access a wide variety of resources and information to engage students. The importance of laws, whether they be those that govern the class, the school, or the country, are consistently reinforced throughout regular school days via our school behaviour policy. Students are taught the value and reasons behind laws, that they govern and protect us, the responsibilities that this involves and the consequences when laws are broken. Visits from authorities, such as the Police and Fire Service, are regular parts of our personal development curriculum and help reinforce this message. The promotion of our school ethos which encourages respect and helps students to distinguish right from wrong. Our Behaviour and Anti-Bullying policies set out our high expectations in relation to rules. Full engagement in awareness days and national initiatives, including National Anti-Bullying Week and Internet Safety Day. Entry into the Magistrates Mock Trial competition for year 8-9 students. Input from local bodies and agencies to support with assemblies and current issues e.g. road safety, PCSO support. Debate club where current issues are discussed and explored in a safe environment. The Magistrates in Schools program is also implemented and serves as a valuable tool in CIAG in addition to discussing and exploring the legal system. Students are actively encouraged to make independent choices knowing that they are in a safe, secure and supportive environment. We encourage them to see themselves as unique individuals able to make a unique contribution to their community, whilst providing boundaries for students to make choices safely. Students receive advice about how to exercise their rights, responsibilities and personal freedoms safely through E-Safety assemblies/sessions and form time activities; they also make personal decisions about their own future during one-to-one meetings with our Careers Advisor (Careers Connect) and when choosing their Key Stage 4 options. Vulnerable students are supported to make appropriate decisions and staff ensure that adults supporting them are doing so with the students’ best interests. A range of visitors to RS lessons and PSHE sessions to enhance the message of making wise choices and support the students in risk minimisation and health promotion. We have support from Mental Health services and School Health who are available to support students and staff in dealing with any issues. We ensure support for the whole school community. Part of our school ethos and behaviour policy has revolved around values such as our ‘Respect’ initiative, with students being part of discussions and collective worship. The school promotes respect for others and this is reiterated through our school rules (READY, RESPECTFUL, SAFE) as well as our behaviour policy. We celebrate individuality and difference within our community. Our RE, PE and Citizenship curriculums teach students about fairness, justice and healthy relationships and encourage them to look out for those who might be marginalised or disadvantaged. The school takes a very strong stance on social inclusion and anti-bullying and the values of respect and responsibility are reinforced where necessary. RESPECT is one of our three school rules which is reinforced by staff. Our students know and understand that it is expected that respect is shown to everyone – adults and children. School assemblies address what respect means and how it is shown. Our Respect initiative displayed around the school is prominent and referred to daily (see handbook). Both in and out of the classroom students are helped to acquire an understanding of, and respect for, their own and other opinions, cultures and ways of life. Staff and students are encouraged to challenge prejudicial or discriminatory behaviours immediately and report any incidents if necessary. All such incidents are recorded and reported to the Local Authority. As a Church school, collective worship is fundamentally Christian in character, but recognises that those attending may have a wide range of faiths, or none. Tolerance of those of different faiths and beliefs is achieved through enhancing students’ understanding of their place in a culturally diverse society and by giving them opportunities to experience such diversity. Collective worship and discussions involving prejudices and prejudice-based bullying have been followed and supported by learning in RS and PSHE. Sir Thomas Boteler Church of England High School has many students who have English as their additional language, all uniquely valued and respected. Our Religious Studies, Citizenship lessons, assembly opportunities and specific curriculum activities (including Educational Visits) encourage an understanding of and respect for people of all faiths, cultures and lifestyles. Discussions about prejudices and prejudice-based bullying in form time, from visitors and bespoke sessions. Recognition and discussion of religious celebrations in lessons, form times and assemblies. Members of different faiths or religions are encouraged to share their knowledge to enhance learning within classes and the school e.g. a discussion of fasting during Ramadan. Through the PSHE and RS curriculums students are encouraged to discuss and respect differences between people, such as differences of faith, ethnicity, disability, gender or sexuality and differences of family situations. We invite visitors from the local faith communities to talk to students about their beliefs. Including a visit from the Warrington Council of Faiths to hold a Multi-Faith day for all year 7 students. We also participate in the Disability Awareness Day with a delegation of students representing the school annually at the school’s event. The Head of RS is chair of Warrington SACRE so is well placed to source visitors and resources to promote tolerance.